Geshe Gyalten was born June 27, 1966 in Bomdia and moved to Lhasa, Tibet. While in his mother’s womb he received his Dharma name, Tseten Gelek, from H. E. Choden Rinpoche. His grandmother, mother and father had irreversible great faith for and devotion to H. E. Choden Rinpoche. They served Rinpoche authentically while he was in Tibet, in solitary retreat for 19 years. Since childhood, Geshe la had a strong wish to become a monk. In 1985, he left Tibet for India to meet H.H. the Dalai Lama, and received his blessing, and advice. The Dalai Lama advised him to study in Dharamsala, India, where he studied modern Western subjects, became the top academic student in his class, and excelled at sports. Geshe Gyal was well known as a fine orator and debater among his Tibetan peers in India at this time. Geshe Gyalten became a monk in 1990, receiving ordination from H. E. Choden Rinpoche who took him as a close personal student. He is often referred to as Rinpcohe’s “Heart Son.” Under Rinpoche’s guidance and instruction at Sera Monastery, Geshe Gyalten learned the Five Great Classical Treaties of Buddhist Philosophy: The Perfection of Wisdom, Middle Way, Logic and Reason, Treasury of Knowledge and Vinaya (monastic discipline) as well as Lam Rim, Mind Training, Tibetan Medicine and Tantra. Geshe Gyalten Kunga received the Geshe Degree (equivalent to a PhD in Buddhism). 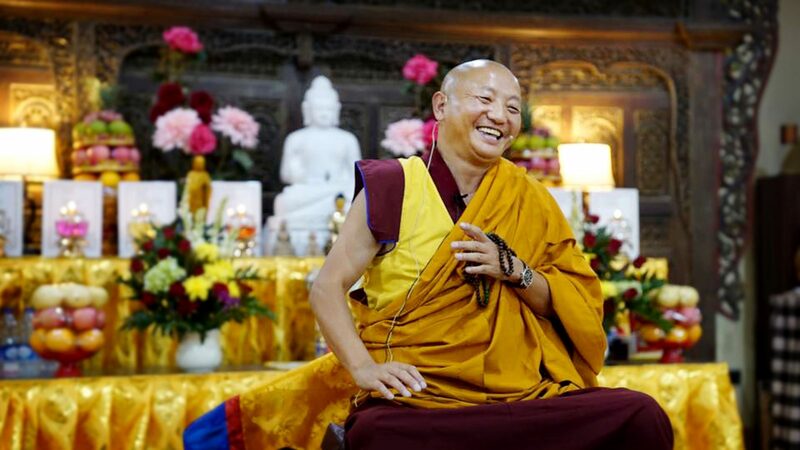 For more than a decade, Geshe la (a term of endearment and utmost respect given by his students) traveled with Rinpoche worldwide assisting Rinpoche and helping to share his extensive knowledge of Buddhist philosophy, meditation, Tibetan medicine, and yoga. Geshe Gyalten speaks five languages: Tibetan, English, Hindi, Chinese and Italian. He is, according to his thousand of students from many countires, modest, kind, patient, sincere, funny and filled with divine energy, a true and devoted disciple of H. E. Choden Rinpoche. As his heart son, Geshe la has taken on the joyous task of spreading the vision and mission of Choden Rinpoche. 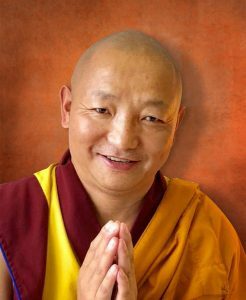 Geshe Gyalten is the Spiritual Director of Awakening Vajra International and guide for various centers throughout the world. He is the author of, Immovable, Like a Mountain: The Mind of Calm Abiding. His teachings, pilgrimages and retreats are profound and life changing, and he is deeply loved by his students. After Rinpoche passed, Geshe Gyalten met with His Holiness the Dalai Lama, asking for his advice about continuing Rinpoche’s projects, such as Awakening Vajra and many related activities including publishing, advancing the Five Branches of Study and many other activities ensvioned by Rinpoche, and the Dalai Lama advised Geshe Gyalten to continue these activities as Rinpoche instructed. Copyright © 2018 Awakening Vajra International. All rights reserved.